Fresh off the release of his celebrated retrospective collection ''Essential'', legendary Hip-Hop producer & emcee, SACH offers up his eleventh solo album. 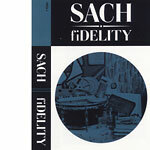 ''fiDELITY'' was recorded in Fall 2015 utilizing a new 24-track supplied by Sach's long-time contemporary Giovanni Marks (aka Subtitle). The results are an eclectic progression of his laidback jazzy production style & delivery first introduced back in his formative years with The Nonce. Live drums, bass & saxophone were woven into ''fiDELITY'', alongside scratching & percussion by long-time accomplice DJ E-Spinfiniti. Album highlights include special guests Mean Green (on the smoker's anthem ''Wise Buds Being Broken'') and Koko on the exuberant ''Cha Cha (In The Lounge With Sach)''.